A wife who witnessed a North Carolina plainclothes officer kill her husband and father of their seven children in 2016 filed a wrongful death lawsuit claiming the police needlessly escalated an unconfirmed marijuana possession incident into a fatal confrontation. The wrongful death lawsuit was filed Wednesday against the city of Charlotte and police officer Brentley Vinson, who shot Keith Lamont Scott three times on Sept. 20, 2016, during a “risky vehicle takedown.” Scott was seen sitting in his SUV allegedly preparing what officers thought might be a marijuana-filled cigar while in possession of a handgun, according to the complaint. Demonstrators march during protests in Charlotte, N.C., Sept. 22, 2016. 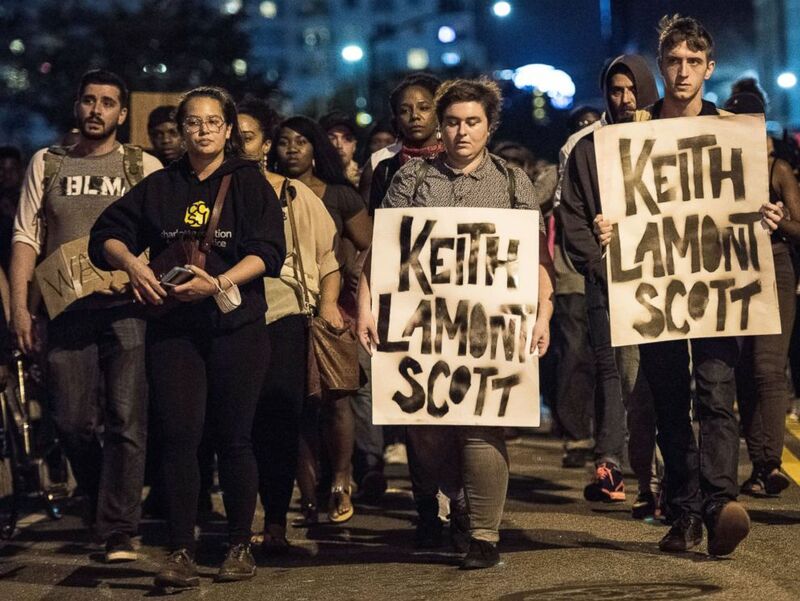 Protests began on Tuesday night following the fatal shooting of 43-year-old Keith Lamont Scott at an apartment complex near UNC Charlotte. The officers from the Charlotte-Mecklenburg Police Department, who were in plainclothes and driving unmarked vehicles, observed Scott and devised a plan on the fly to arrest him while conducting an unrelated stakeout of a fugitive, according to the lawsuit. The officers, according to the suit, did not discuss less-lethal methods to take Scott into custody before confronting him. None of them were equipped with stun guns or pepper spray at the time. Neither Vinson nor any of the other officers involved in the incident were charged. After reviewing the evidence, Mecklenburg County District Andrew Murray concluded in November 2016 that the officers had acted lawfully and the shooting was justified “based on the totality of the circumstances.” In a 22-page report detailing its investigation of the shooting, the DA said Scott was armed and ignored at least 10 police commands to drop his semi-automatic pistol before Vinson opened fire. “I’m extremely convinced that Mr Vinson’s use of deadly force was lawful,” then-District Attorney Andrew Murray said two months after the shooting. Keith Lamont Scott is pictured in this undated family handout photo. Murray’s decision prompted days of angry protests in Charlotte. Jordan Ashley-Walker, a spokeswoman for the city of Charlotte, said city officials had anticipated the lawsuit from the Scott family but declined to comment on the suit. “We will respond to the allegations through the judicial process,” Ashley-Walker said in a statement. Scott, 43, was shot dead as his wife, Rakeyia Scott, stood by, pleading with officers not to shoot her husband and asking him to come out of the vehicle, according to the lawsuit. She also tried to explain to the officers that Keith Scott was still recovering from a traumatic brain injury he suffered in a November 2015 motorcycle crash. 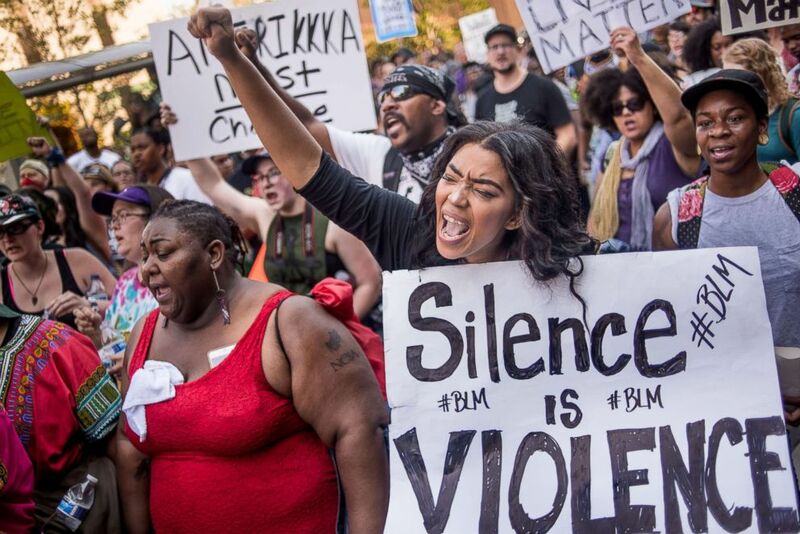 Demonstrators march through the streets following a rally at Marshall Park on Sept. 24, 2016 in Charlotte, N.C.
“He’s not going to do anything to you guys. He just took his medicine,” Rakeyia Scott, who made a cellphone video of the fatal encounter in the parking lot of their Charlotte apartment complex, told the officers, according to the court papers. Scott was sitting in his vehicle in a shaded area waiting for one of his children to come home in a school bus, according to the suit. 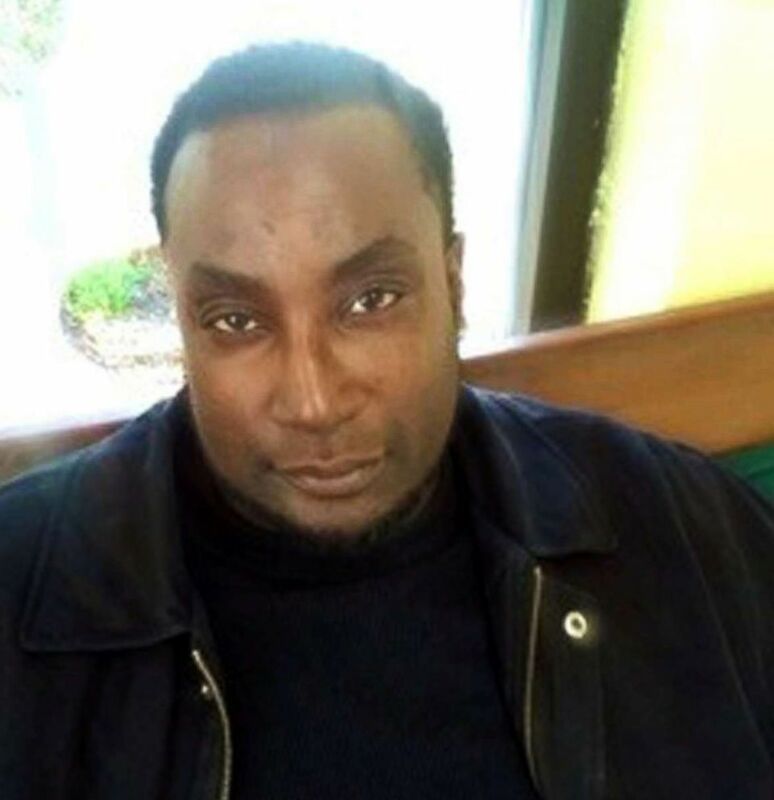 “The officers make no attempt to speak with Rakeyia Scott to learn more about Keith Scott’s traumatic brain injury, any cognitive impairment he may have, his other medical conditions or the medications he had just taken,” the lawsuit states. 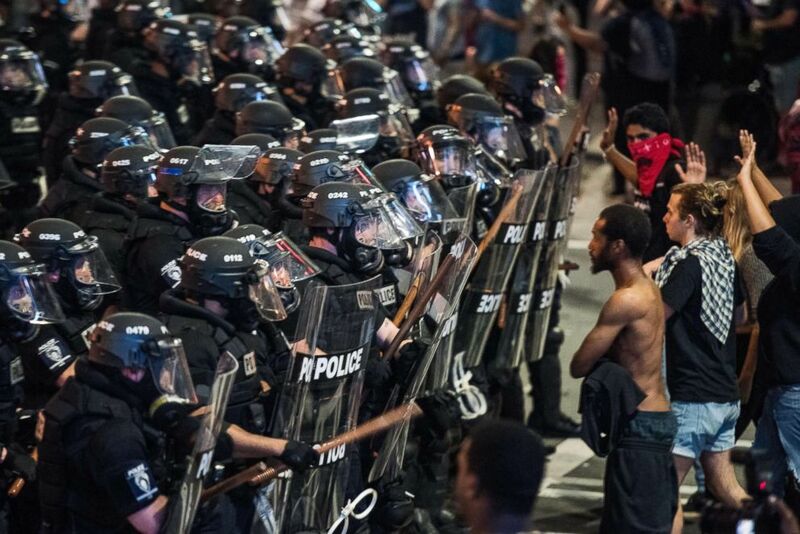 Police officers in riot gear approach demonstrators on Sept. 21, 2016 in downtown Charlotte, N.C. Instead, according to the suit, the officers escalated the situation by surrounding Scott’s vehicle with their guns drawn. One uniformed officer smashed his passenger-side window with a baton. “The decision to perform the vehicle takedown on Scott needlessly escalated the situation from a routine arrest to a situation that is now unpredictable and which significantly increases the risk of injury or death to both the suspect and the officers involved,” according to the lawsuit. Officer Vinson, who joined the police department in July 2014, was asked to remain in his vehicle due to his lack of experience with this arrest procedure, while three other plainclothes officers and one uniformed officer attempted to remove Scott from his SUV, the court papers state. But Vinson “abandoned his assigned task,” got out of his vehicle, drew his weapon and took cover behind a minivan, according to the lawsuit. 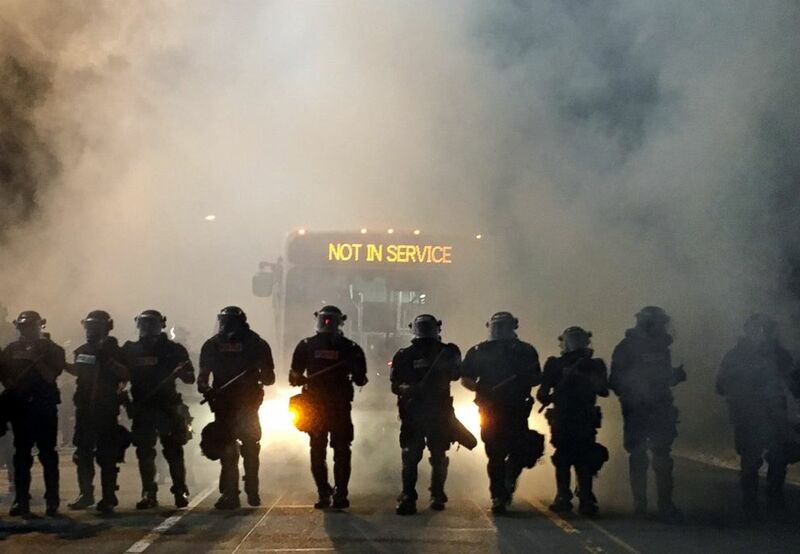 Police officers wearing riot gear block a road during protests after police fatally shot Keith Lamont Scott in the parking lot of an apartment complex in Charlotte, N.C., Sept. 20, 2016. Scott eventually came out of his vehicle with his hands at his side. Police officials said an officer’s body-camera video showed a gun in Scott’s hand as he exited the SUV. Scott did not obey repeated orders to drop the weapon, police said.